Update 7/21/16: They’re back!! The goliath groupers have begun their yearly aggregation on our wrecks and reefs. We are seeing well over two dozen on the Corridor wreck. We counted half a dozen of them on our newest wreck, the M/V Ana Cecilia. This ship wreck was sunk just ONE week ago! Reserve your spot to dive with the groupers early as our trips are filling fast. Imagine yourself face to face with a massive fish weighing in the triple digits. It’s friendly demeanor and curiosity gets you within arms reach of it many times. Now multiply this encounter by sixty plus and you are experiencing the best goliath grouper diving anywhere in the world. Palm Beach, Florida is hands down the best place to be if you want to see these leviathans in all their splendor. Every year during the months of August through October, goliath groupers travel up and down the Florida coast on their way to Palm Beach, Florida. This annual aggregation happens (scientists believe) for one sole purpose — reproduction! The wrecks in Palm Beach are the perfect hangout for these behemoth fish. Dive on any wreck and you are bound to come across plenty of goliath groupers, but certain wrecks tend to attract the mass numbers. 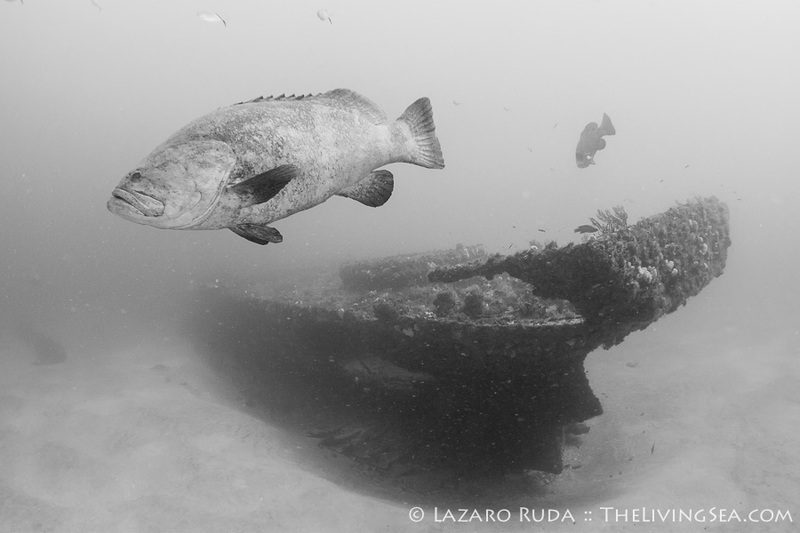 The Corridor wreck system is one such series of wrecks where the goliath groupers really stack up. Today’s morning trip included a stop at this great series of wrecks in search of the goliath groupers. Conditions were quite perfect for this dive, too. Water temperature was in the 80s and visibility was in the 50ft range. With no current, moving around the vicinity of the wrecks, in particular the Mizpah (the first of four wrecks and an artificial reef), was easy to do. As we slowly descended to the Mizpah we could clearly see these leviathans hovering side by side like fighter jets. Their massive size commanding a double-take. As we slowly approached, these goliath groupers would slowly swim away. Easily outweighing and almost out sizing the divers, these large sea bass (the largest of their kind in the world) are actually quite timid. Getting close takes a little time for them to build the confidence to approach you. Chase them and you’ll be doing nothing more than getting tail shots of these fish and running low on your air supply quickly. Although massive in size, the goliath grouper can easily out-swim even a scooter-propelled diver. Sitting back and letting their curiosity get the better of them is the best recipe for those closeup shots. Swimming amongst these giants is a lot of fun. Getting a short glimpse into their secret life is divine! So little is known about the life history of these groupers. With every dive, a discriminate observer will learn a little more about their behavior. The beauty of this wreck dive is not limited to just the goliath groupers, either. Sea turtles, rays, and countless fish live around these wrecks. 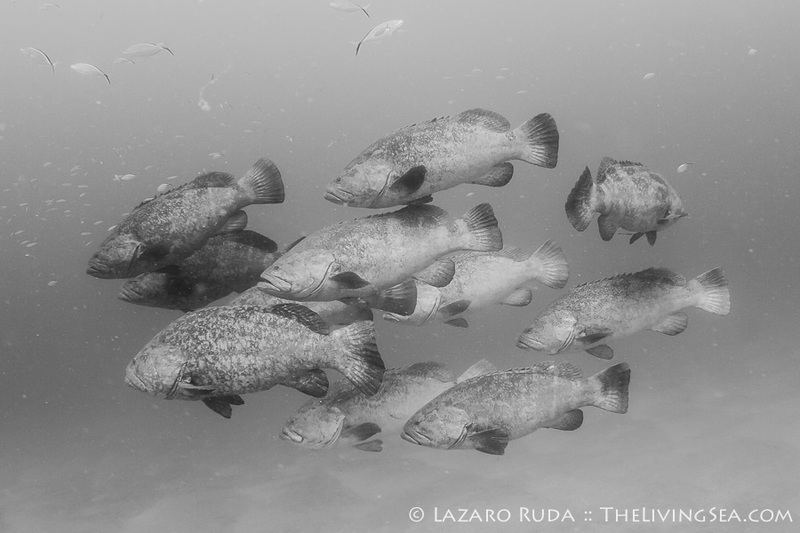 The goliath groupers themselves are like a free-swimming reef — a haven to countless baitfish that encircle the groupers. With today’s ideal conditions and 3-4 dozen goliath groupers to keep us in a constant state of awe, it is easy to understand why a few of us decided to do a second dive on the same wreck while the other divers were at a nearby reef. Needless to say, over two hours of bottom time with these groupers was certainly not enough. These dives are filled with excitement and some wonderful encounters. If you want to dive with goliath groupers then look no further than Palm Beach, Florida. This is simply the best goliath grouper diving in the world. If the photos from today’s dive don’t convince you, then make sure to check out the recent article written in the National Geographic Magazine about the goliath groupers. The goliath groupers normally stick around, with their numbers increasing throughout the months, until October. These dives are very popular so you can count on us diving on the wrecks often in the coming month. Don’t miss the opportunity to see these massive fish in all their splendor. Call us to book your spot! 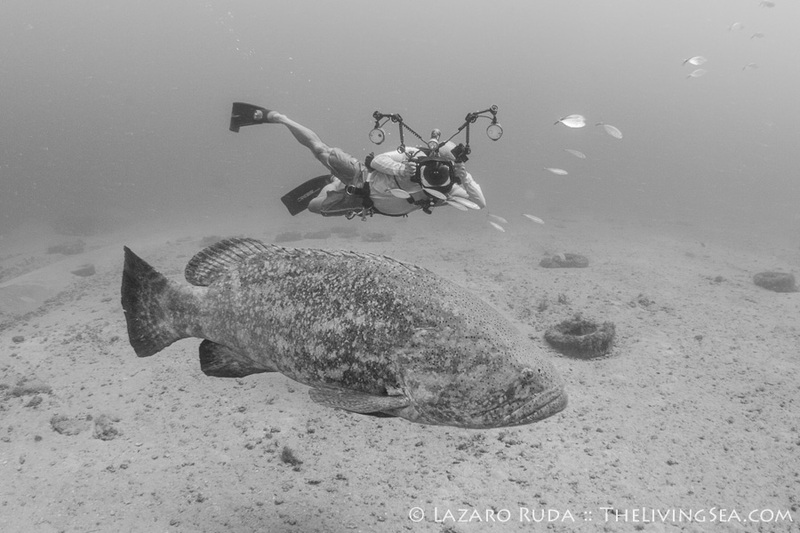 Update: Check out one of our recent blogs about diving with goliath groupers in Palm Beach. How many dives are accomplished on each boat trip? # of feet of visibility? We do 2-tank dives on our trips. Our southern reefs, south of the Lake Worth Inlet, are generally 45 to 60 foot deep. North of the inlet we have deeper reefs and wrecks and they vary in depth, generally 75 to 90 foot, depending on the site of course. The visibility varies day to day as the Gulf stream and weather conditions change. But for the most part 40-6o foot of visibility is our average. Today was a good day as we had 60-70 foot of vis.